Fair of the First Mile at the B&O Railroad Museum: a fun-filled outdoor festival on April 18 & 19 for guests of all ages, highlighting the railroad’s historical entwinement with horses and police. 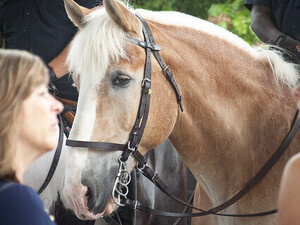 Families will meet the award-winning Baltimore City Mounted Police horse Dino, known as “Big D,” and other members of the unit on Friday, April 19 from 11am – 1pm. “Big D” was awarded the Klinger Award in October 2018 for best demonstrating the values of honor and service as embodied by Klinger, a special horse who has touched the lives of many in his life of service with the 3rd U.S. Infantry Regiment (The Old Guard) Caisson Platoon.